With the suspension in the rear, the fun only starts, that is what all mountain bikers of this world agree on. Owing to the rear suspension shock, your bike (or more exactly expressed the rear stays) "swallows" all unevennesses and rolls smoothly over rough and smooth terrain, larger and smaller bumps. The repeated fast soil contact which is enabled by the suspension, is probably the greatest advantage of all, since this gives you more control over your bike. It is the spring element at the rear stays, which is responsible for that, but only if the bike and the shock fit together and the suspension optimally fulfills what it is supposed to do. If the suspension is not correctly adjusted or has not been chosen fitting to the bike and your riding style, the trip will certainly not be as much fun for you as you desired, in better words, the fun with your bike will quickly have lapsed. A shock which perfectly works in your buddy's bike, might work to the contrary in your bike. The socalled kinematics of the suspension plays a large role in deciding which shock is the correct one for you. What is the shock? And which shock is right for me? Spring and damper are designed as combined shock. . The hydraulic dampening has been implemented for all high-quality suspension elements in the MTB segment. For the rough application, there are also variants with piggy backs for a larger oil volume and thus a better cooling. Whether the object of desire now springs with steel spring, titan spring or air is a matter of taste and dependent on the application area and certainly also a little bit on the available money. Freeride and downhill bikes rather use the stronger steel suspension shocks, which stand for rougher purposes and a corresponding longer service life. Whoever has an eye on the weight, will rather purchase the lighter candidate, the air shock. An air shock also is the better choice if the mountain bikers (mainly the female bikers) are light weights since these shocks can be adjusted to be softer and are better suitable for lower weights of the riders. You have to take special care when choosing a model if you want to exchange the shock. Since in this regard, the shock strokes and length are crucial! Do not forget that they cannot be changed anymore, contrary to the installation width. Once the shock is installed or you just have a new bike ready for your first ride, you should absolutely first of all perform the most important shock adjustments: Sag, rebound and compression damping. Here, the frame manufacturer can help you with the suggestion of the required shock. With stroke we mean the displacement which the damper can deflect. Multiplied with the transmission ration of the rear stays, which results from the kinematics, you can calculate the travel of the frame. The displacement which the damper deflects only by sitting on your bike is called the negative suspension travel or sag. Mostly approximately 25% +/- 5% of the entire stroke should be used depending on the area of application. The compression damping controls the compression speed, while the rebound controls the speed of the de-compression. It is up to your taste and riding style whether you like a fast responding suspension with "pop" or whether you like it "softer". 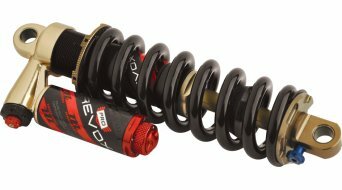 Discover the various top models in terms of rear suspension now in our online shop for bike shocks. We have different shocks for the mountain bike, your freeride bike or your downhill bike in our large range. Needless to say, we have them at favourable prices.